UPR Pro Street Solid Upper & Lower Control Arm Package upgrades your factory stamped steel control arms for your 11-14 Ford Mustang. Both featuring Chrome Moly components for strength, durability as well as weight saving. The Pro Street upper is a factory length replacement but made from Chrome Moly tubing to eliminate flex commonly found in the stock arm. The Pro Street lowers are stock length replacements also made from Chrome Moly tubing. 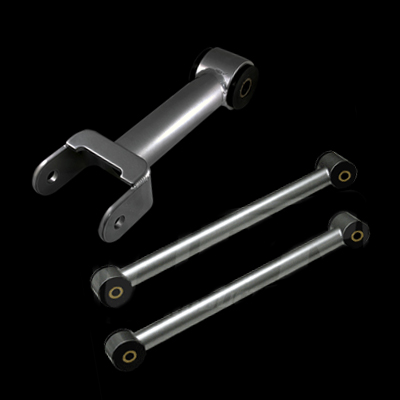 Both use Energy Suspension urethane bushings and large steel tool pins that eliminates deflection and ensures the longevity of these arms. All of our Suspension Products are made with the Highest Quality materials and most expensive components. We spare no expense on our products and always stand behind them with our Lifetime warranty that no one else offers. Installs in 3 hours with basic hand tools. 2011 2012 2013 2014 Mustang GT 5.0L Coyote 4V V6 V8 281 Shelby Roush Saleen & Steeda Vehicles. No one else can stack up to the bold clean styling of our aftermarket Billet dress ups, Street Strip & Racing Suspension & Performance Parts for your late model American Muscle Car!